Getting out is not easy either. An Ifreet runs to you, with the remix music of "Beginning". You will be surrounded by Bitterflies, Cave Trolls, Copper Armors on your way, and another Ifreet at left end. The upper right exit leads to a warp room, the upper left exit to a save room, and lower left to deeper. The candle containing Autograph in Normal Castle is now a common one. While there are no more poisonous drops, you will encounter some Blue Venus Weeds. The first part of the passage has Cloaked Knight, but the real problem lies in second part, which is flooded with Bitterflies and Skeleton Guardians. These armored guards can draw back with shields on, then charge forward. 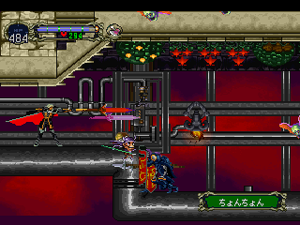 At the lone room at far left end, you can find Alucard Spear, which seems to be the same one wielded by Eric and Jonathan. This page was last edited on 21 March 2015, at 11:03.